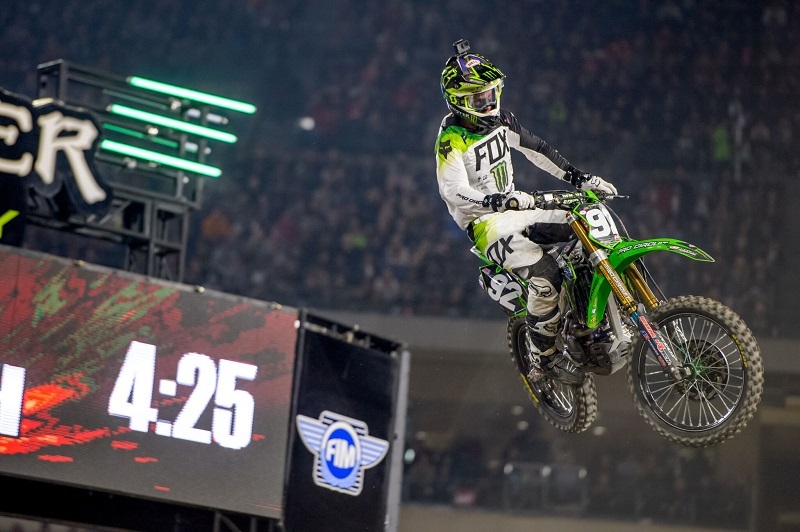 CORONA, Calif. (January 10, 2018) – The Monster Energy Pro Circuit Kawasaki duo of Adam Cianciarulo and Joey Savatgy will head to NRG Stadium in Houston for the first time in both of their careers this Saturday, January 13. The large football stadium provides a more open layout compared to what the riders faced this past weekend at the season opener. Following their solid rides in Anaheim, Cianciarulo sits third and Savatgy fourth in the Western Regional 250SX championship standings. Cianciarulo raced under the lights of Angel Stadium for the first time and proved he was able to overcome the nerves of an opening race with a third-place finish. The 21-year-old is now ready to dig in and collect his sixth career win. The open layout of NRG Stadium is a welcomed change for Savatgy who noticed it was hard to make passes on the tight Anaheim track. Despite the track conditions and a mid-pack start, Savatgy pushed his way up to fourth and put himself in a good position as the series heads to Round 2. The four-time winner is ready to add another win in Texas. Prior to Saturday’s race the Monster Energy Pro Circuit Kawasaki riders will be signing autographs on Friday, January 12 from 6 – 7 p.m. at Wild West Motoplex in Katy, Texas. Saturday’s race from NRG Stadium will be broadcast live on FS1 starting at 8 p.m. ET. To find out more about Pro Circuit products, visit www.procircuit.com.